Lord 10-Wind, on the left, is actually making a request gesture and Lord 4-Jaguar is signalling his acceptance. They feature in one of the precious few pre-Columbian Mixtec codices to have survived the Spanish Conquest. Called the Codex Colombino-Becker, it has ended up divided into 7 fragments (with 4 additional segments still being lost), split between two countries (Mexico and Austria) and bearing different names. Its contents is entirely historical events: basically it tells the story of the famous Mixtec leader Lord 8-Deer. As part of her meticulous [super-detailed] study of the contents of the Codex, Nancy Troike looked at the nature and shapes of all hands shown in the manuscript. This showed that hands were pictured in only 3 forms: pointing, flat, or busy holding an object. By checking all the examples in the codex very carefully, she noticed that two gestures often appeared to occur reciprocally [in pairs] when figures were shown meeting face to face. What did they agree to? We’ll probably never know! As Nancy Troike writes: ‘These specifics, which would of course be different for each historical situation, were already stored in the minds of the trained readers who had learned the story of Lord 8-Deer in this codex.’ The gestures worked simply as what experts call ‘mnemonic guides’ to the meaning in the scenes - in other words, memory aids. 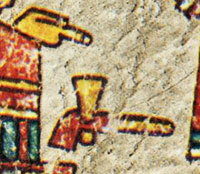 It’s the common image representing “Tepoztli”. See the place name glyph for “Tepoztlan”. That red thing could be just a wooden artifact and those yellow things carved on it could be stones. Aren’t macuahuitl wooden swords carved with stones? I think they could be dealing a weapon or just somethin’ as a tool. It’s not a pistol or a pipe but a ceremonial axe from a crafts man, usually jade but picture color suggests gold. Maybe it’s a trading agreement on how much they should trade on ropes & pipes/tobacco. The “pistol” looks like a meso-american pipe to me. Mexicolore replies: Could well be. Perhaps the rope-like object above could represent ‘tying up’ a deal: so these two were agreeing a trade in tobacco? !